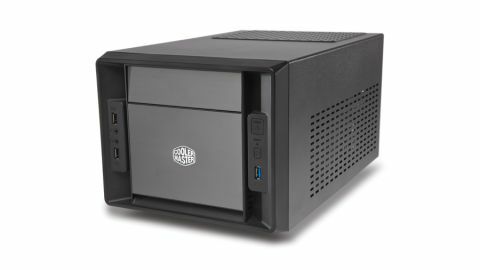 Cooler Master's latest mini-ITX chassis is the cheapest of all the wee PC boxes we've looked at in recent times. There are areas where this definitely shows, but for the most part this is an incredibly good value case for your mini build. There are essentially two ways you can go with a mini-ITX case. You can either stretch upwards, like the Prodigy or Lian Li case, or you can go low and deep. The Elite 120 is going for the latter approach, letting the chassis extend backwards further than it rises from the ground. Inevitably that means there's less space inside the case for airflow, but Cooler Master has taken a drill to the top and sides and ventilated the living hell out of it. It's a wise move by the self-styled masters of cooling, giving the top-mounted PSU a ventilated grill to pull down fresh air into its toasty innards. The mesh on the left-hand side of the case then allows a discrete graphics card to also get access to a bit of a breeze to help chill its chips. That length of chassis also means, like the Prodigy and unlike the PC-Q03B, you can fit any dual-slot graphics card you want into your micro build. It's not a squeeze, either, with enough room to funnel the necessary power connectors to the PCIe power sockets. Where it is a squeeze is on top of the mini-ITX motherboard itself. You're going to need a seriously low-profile CPU cooler to fit beneath the PSU mount since it sits directly above the CPU socket on the mobo. That then limits what sort of machine you really want to put together. There's no chance of getting enough cooling to your CPU to allow for any overclocking, so a Z77 board would be a complete waste. Still, for gaming the GPU is more important for decent frame rates, so a H77 board with a stock-clocked CPU would still allow for an excellent wee games PC. Aesthetically, though, it's really no great shakes. The build quality is good, but the overall look of the box doesn't capture the imagination the way the beautiful BitFenix case does. It's not a chassis you'd use to lovingly build a space-defying gaming rig - it's much more of a workman-like offering. That's possibly due to its Cooler Master heritage rather than it coming from the connected Cooler Master Storm gaming stable. The oblong lines are much more serious than stylish. But still, for the price, it's an excellent option for building that bargainous mini PC. That's especially true when you consider the £100-odd price tag of the lovely Lian Li case. The only real thorn in the Elite 120's side is the fact the awesome Prodigy is available for a scant £20 more. That chassis has all the style and still manages to offer enough space to be able to build one serious, overclocked gaming mini-behemoth. The Elite 120 is close to being a great case. But the proximity in price of the prodigious BitFenix chassis means it's hard to recommend this Cooler Master case over its rival.